The book examines how ex-combatants in post-war and peacebuilding settings engage in politics, as seen in the case of Liberia. The political mobilization of former combatants after war is often perceived as a threat, ultimately undermining the security and stability of the state. This book questions this simplified view and argues that understanding the political voice of former combatants is imperative. Their post-war role is not black and white; they are not just bad or good citizens, but rather engage in multiple political roles: spoilers, victims, disengaged, beneficiaries, as well as motivated and active citizens. By looking at the political attitudes and values of former combatants, and their understanding of how politics functions, the book sheds new light on the political reintegration of ex-combatants. It argues that political reintegration needs to be given serious attention at the micro-level, but also needs to be scrutinized in two ways: first, through the level of political involvement, which reflects the extent and width of the ex-combatants’ voice. Second, in order to make sense of political reintegration, we also need to uncover what values and norms inform their political involvement. The content of their political voice is captured through a comparison with democratic ideals. 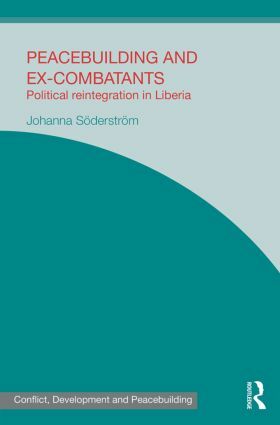 Based on interviews with over 100 Liberian ex-combatants, the book highlights that their relationship with politics overall should be characterized as an expression of a 'politics of affection'. This book will be of much interest to students of peacebuilding, African politics, democratization, political sociology, conflict resolution and IR/Security Studies in general. Johanna Söderström is a postdoctoral researcher at the Department of Government, Uppsala University, Sweden and has a PhD in Political Science. This series publishes innovative research into the connections between insecurity and under-development in fragile states, and into situations of violence and insecurity more generally. It adopts a multidisciplinary approach to the study of a variety of issues, including the changing nature of contemporary armed violence (conflict), efforts to foster the conditions that prevent the outbreak or recurrence of such violence (development), and strategies to promote peaceful relations on the communal, societal and international level (peacebuilding).